We’ve learned that Dutch children can build their own village in four days using teamwork, so it’s no surprise that the enterprising kids can also team up to power the Bicycle School Bus. 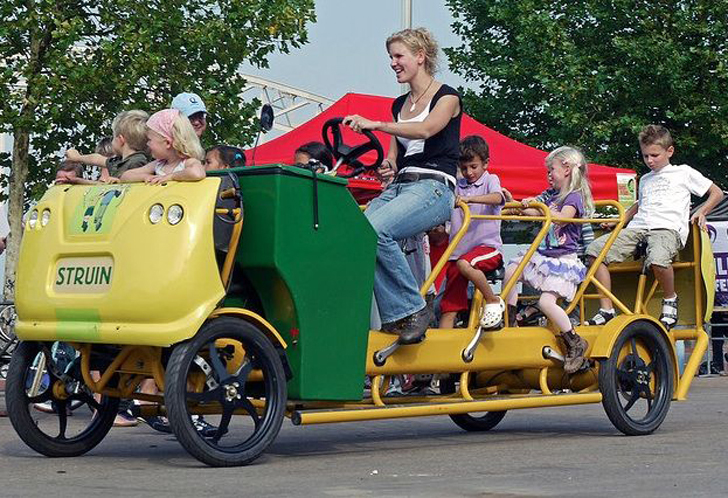 Designed and built by Tolkamp Metaalspecials, this excellent mode of transportation features eight sets of pedals to accommodate kids ages 4-12, a driver’s seat for an adult, and three benches for non-pedaling passengers. Capable of reaching a speed of up to 10 MPH, and equipped with a sound system and an awning in the event of rainy weather, what student wouldn’t want to make the wheels on this bus go round and round, all through the town? While there is a motor on this oversized bicycle, it can run on kid-power alone if all passengers are on deck. So far this sweet ride, priced at $15,000 (a bargain compared to a gas-guzzling standard school bus), is only available in Europe, but we’d love to see it stateside so our kids could get some exercise and help save the earth, all before the first school bell rings. We've learned that Dutch children can build their own village in four days using teamwork, so it's no surprise that the enterprising kids can also team up to power the Bicycle School Bus. Designed and built by Tolkamp Metaalspecials, this excellent mode of transportation features eight sets of pedals to accommodate kids ages 4-12, a driver's seat for an adult, and three benches for non-pedaling passengers. Capable of reaching a speed of up to 10 MPH, and equipped with a sound system and an awning in the event of rainy weather, what student wouldn't want to make the wheels on this bus go round and round, all through the town?